Six minutes remained in Wednesday's closely played High Desert Soccer Conference tournament game between the host Community School and visiting Buhl Tribe when Cutthroat coach Richard Whitelaw did something very unusual. Normally the picture of self-control and reserve along the sideline, in fact, usually seated on the bench, Whitelaw jumped in the air with excitement. His Cutthroats, clinging to a 1-0 lead, had just withstood a furious Buhl series of attacks and had just finally sent the ball back downfield on a goal kick. Whitelaw, witness of thousands of soccer games in his life, sensed a game-defining crisis had passed. His defense had repelled Buhl's best attempts. After three losing seasons, it seemed to the 20th-year Cutthroat head coach that his team would be returning to the State 3A soccer tournament. There was no last-minute disappointment for Whitelaw and the top-seeded Cutthroats (10-3-2) on a cool, sunny day at Elkhorn's Browning Field. Only seconds after Whitelaw's little leap of joy, Cutthroat junior Mason Noyes chased down a ball on the right wing and made a beautiful cross pass that senior Will Brokaw headed into the Buhl net. One of the season's prettiest and most timely goals finalized the 2-0 Cutthroat win. It was the second goal of the game for top Cutthroat scorer Brokaw (11 goals). He punched home the first goal in the Buhl box four minutes into the HDSC win-or-go-home contest after a long sideline throw-in from senior Hunter Weaver. The victory secured a state tournament trip—one of two earned by Cutthroat teams on a memorable Wednesday. Simultaneously, coach Kelly Feldman's Cutthroat girls won their third consecutive HDSC tournament title in come-from-behind fashion, 5-2 at Buhl. But at Browning Field, there were many chances for No. 3-seeded Buhl (8-5-4) to extend its mastery over the Cutthroats that included a 1-1 tie and 1-0 win on the same pitch Sept. 15. "A great game. We were on our heels, but we defended well," said Whitelaw afterwards, happy yet chilled after being doused with celebratory liquid by senior Cassidy Carson. "We didn't have a lot of chances. Buhl is a good team." Buhl, out-shooting the Cutthroats 12-10 including a 15-5 differential in corner and free kicks, nearly pulled ahead in the first minute on an Alex Arizmendi corner kick that senior Daniel Soria redirected toward the corner of the net. But senior goalkeeper Tom Crosby (11 saves) made a huge save, keeping it scoreless. Co-captain Crosby was Whitelaw's "Man of the Match." He made three other great stops, all on Buhl senior Gustavo Magana, while the Cutthroat defense of Zach Lindahl, co-captain Colin Waycott, Calder Zarkos and Tim Kanellitsas played with maturity and resolve in front of him. Because the No. 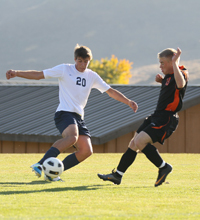 4-seeded Filer Wildcats (9-6-3) captured their first-ever HDSC title 4-3 over Gooding Wednesday, the Cutthroats will host Gooding (8-3-3) today, Friday at 4:30 p.m. at Browning Field. Both teams are going to the State 3A tournament Oct. 20, but today's game is played for seeding. Winner of today's second-place game opens state Thursday at 2 p.m. at Vallivue High School in Caldwell against the Pocatello-area champion (Snake River, American Falls or Marsh Valley), while the loser of today's game debuts Thursday at 2 p.m. against Boise-area champion Payette. Coach Feldman's No. 2-seeded Cutthroat girls (13-4-1) stretched their season unbeaten streak to 13 games by rallying from a 2-0 halftime deficit and winning 5-2 over top-seeded Buhl (12-2-3). Sophomore Hannah Dies (20 goals season, 39 career) made it nine goals in her three HDSC tourney games with a three-goal hat trick, sparking the Cutthroats after the half. Buhl was a player short, its goalkeeper red-carded just before the half. Dies tied the game 2-2 with her first two goals, then junior Ellie Swanson (17 goals, 57 career) provided the eventual game winner. Other goals by Dies and sophomore Hayley Murach accounted for the 5-2 final that sent the Cutthroats to state for the 11th straight year. Feldman's Cutthroats have won two straight State 3A consolation titles, and in 60 games over the past three years have outscored opponents 285-70 including 31 shutouts. The Cutthroat girls debut state next Thursday at 11 a.m. against the northern Idaho runner-up team. Last year's champion was Snake River over defending champion Payette, with Timberlake third. Tuesday was a difficult day for the Wood River High School girls' and boys' soccer teams. Coach Jenni Conrad's Wolverine girls (11-3-2) saw their remarkable string of seven straight Great Basin Conference tournament titles come to an end with a 4-0 loss to top-seeded Twin Falls (11-3-2) in the championship game at Sunway Soccer Complex in Twin Falls. The Wolverines tried to keep their hopes alive for a 17th straight state tournament trip Thursday with a loser-out home game against Jerome (6-8-2). If Wood River won Thursday, they would play either Skyview of Nampa or Middleton on Saturday at 3 p.m. on the Sunway field for the right to advance to the State 4A tournament Oct. 20 in Caldwell. Meanwhile, the Wood River boys' team (8-6-2) saw its 2011 season come to an end Tuesday with a 3-2 penalty kick shootout loss to Minico at Rupert. Liam Jablonski, Jeffrey Espejo and Alex Lopez scored for Wood River. See Wednesday's paper for a season wrap-up.